Pinewood Cemetery is one of the oldest cemeteries in Miami, FL, and even after so many years the shades of these Old Florida pioneers still walk among the faded tombstones. This is a brief, historical background on what was originally a simple, one acre, rural cemetery established in the late 1800s, where pioneers that settled in the Miami area interred their dead. In 1906, three acres were added, and these four acres sit unobstrusively surrounded by a low, rock wall fence in the middle of an older but upscale section of Coral Gables. 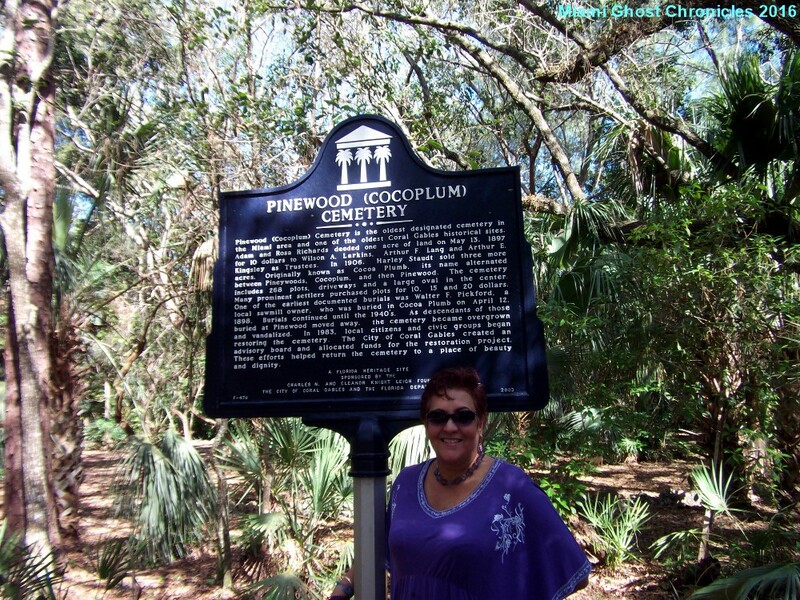 Passing in a vehicle you might take it for a small, shady park where the local residents sit on a bench and envision what Old Florida was like, that is until you spy tombstones that lie scattered inbetween the paths that run through the grounds. 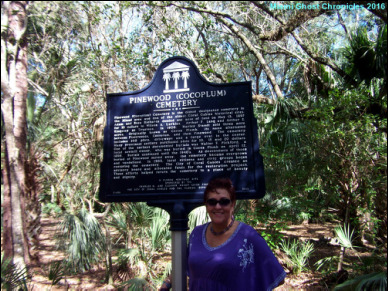 Originally named Larkins Cemetery, it was changed to Cocoplum, Pineywoods and then to its present name. Records indicate that there are approximately 200 recorded burials, however based on information verbally passed on by older residents of the area, use of the cemetery possibly took place as early as the 1850s and the latest was in the 1970s, officially though it was from the 1890s to the 1940s. ​Researchers believe that there is more than the 268 plots which are listed on the burial map, as human bones have been dug up in the periphery area of the cemetery during construction of modern homes. It’s not confirmed if these were unaccounted graves from the cemetery, or burials from an earlier time when the hot climate, a lack of undertakers and no cemeteries forced families to bury their dead in unhallowed ground. Historical artifacts such as a letter dating from 1908 to the county commissioners describe where plot 58 was used to bury paupers (yes that's plural, as in more than one body). After the 1926 Hurricane efforts were made to clean the cemetery, but these efforts became less and less as the years went by and the families of the deceased, or others who owned plots moved away. In 1983 citizens and the City of Coral Gables initiated a restoration project and some new headstones were erected however, most graves are now only shallow indentations in the ground, that is if they’re not covered by vegetation. Over the years, reports of paranormal occurrences range from midnight burials (which was probably someone picking up graveyard dirt for rituals), to drug parties to animal sacrifices. In 2007, a New Times reporter interviewed a local resident who agreed to speak only under conditions of anonymity. She told the reporter that in the fall of 2006, she had found “a headless chicken and other religious relics”. She believed them to be a result of Santeria rituals being carried out on the grounds. She said she was outraged along with other Coral Gables residents in finding evidence that animals were being sacrificed in a cemetery that was situated in a residential area, but preferring to err on the side of caution, she also stated the she believed in the Santeros' hexes and didn’t want them coming after her. Many of the reconstructed headstones give a glimpse of the hardships faced by these early Miami settlers as they retell the death of infants and young children, others are downright mysterious as well as tragic, such as the one for Dora (Perry) Suggs. On her tombstone is written: 1872, December 18th, 1905. Died tragically at the Devils Den, Wife of Gideon David Suggs. The story of her death is so much more than those few words on her headstone. In 1905, this 33 year old, mother of two, left her farm in a mule-drawn wagon to purchase supplies. Several hours later the wagon returned without her, and a search party retraced her steps into the night trying to find her. They approached a narrow and overgrown stretch of road known as Devils Den (present intersection of Granada and Blue Rd). This is where they found her. She was raped and then murdered with a heavy rock which was used to crack her skull. There was evidence where she had struggled tremendously against her assailant. The area was avoided by the local residents until 1916 when the area was cleared. Her husband Gideon died in 1957. The story of Dora's murder was reported throughout the state of Florida, in South Carolina and as far away as Washington DC. Research of newspapers of that time detail the event and also later reports in March 1906 where Edward "Cady" Brown was tried, found guilty of her murder and sentenced to death. He was executed by hanging in June 1906. (Further below a copy of the St. Lucie Tribune Dec. 22nd, 1905 which had some of the most lurid details about the crime). Other tragic deaths briefly related on their headstones is that of seventeen-year old Lillian Grant Freeman, wife and mother of 2 year old “Winnie” who died after sustaining burns while making supper, and 18 year old Delia Blythe Branam who was buried with her infant on August 26th, 1908 after both died in childbirth. When I visited this cemetery it was in the middle of the afternoon (since it’s only open until sunset), and the weather was anything but what would be described as typical cemetery weather. There were blue skies, puffy white clouds and a nice breeze blowing as I walked slowly through the cemetery snapping pictures of the headstones. Since it was a weekday it was not unusual to find that initially I was the only one in the cemetery. Reading the epitaphs you feel the sense of history that is usually gone when you live in a city as large as Miami and which has changed so much over time. There was no prickly feeling of dread, no sense of being watched, none of the sensory warnings that you experience when you are in the presence of a ghost or otherworldly being. About 20 minutes into my walk I saw a gentleman striding quickly behind me, a chocolate colored Labrador trotted ahead of him as he spoke on his cellular phone. As he passed by me, he waved hello, I said hi and off he went on his quick paced stroll. As I stared up the path where he was leaving, which I had been watching only a few second before, I saw what appeared to be the figure of a young man dressed in jeans and a white, striped polo shirt who was standing behind one of the trees. Immediately I was trying to figure out how I had not seen him before, either standing there or approaching the area where the tree was. The cemetery is not really that large. I had a very good view of the path leading up to the tree which he jumped behind, and just as I had seen the man walking his dog long before he came up to where I was at, there had been no sign of this figure before then. I could not see his face, only part of his torso, his arm and a leg as he darted behind the trunk of a thick tree. I looked behind me and saw no other persons, and when I look again, there’s no one standing behind the tree. Even if he asked Scotty to beam him up, could this person have disappeared in the three seconds it took for me to bring my gaze back to the area in front of me. I hurried up and walked to the tree, no one was there, no one was close by. No talking, no noise, nothing, zilch! Even now after so many years working as a paranormal investigator I still get these great surprises. I didn’t take a picture, because of course I am reading epitaphs about people who died about eighty years ago, and what I now realize was a full body, solid apparition dressed in modern clothes, was the last thing I expected to see in broad daylight. I initially took him for a local resident visiting the cemetery or another sightseer. Even my videographer Henry, who had stayed sitting at a bench at the entrance to the cemetery, wasn’t around to corroborate my story. Later I did ask him if he had seen anyone that fit that description, and said he no, however he did recall seeing the man walking his dog enter the park. Afterwards as the shadows lengthened towards late afternoon, for about thirty minutes I stood by my car which was parked across the street, and where I could see anyone exiting the cemetery, waiting to see if that young man made an appearance and put to rest that niggling feeling that the supernatural had the last laugh on me that day, and of course no one did. I would love to hear from anyone who has had a similar sighting of this figure in or around the cemetery, or has heard of a story from someone else. No doubt this ghost has a story that needs to be known.